Carlson Becker, missionary in Macau, reports that they started “Practice Church services” on November 20, as they lead up to formally launching a new church on Taipa Island on February 28. “We had 9 people present, with most of them being staff members. Michael and his wife (Michael is our co-worker in the ELP and Church), the Chinese tutor that Jen Blandin and Naomi and I are studying under, and his wife came along with the American staff. So we had 4 Chinese and 5 Americans. We are working to put together a worship service that will minister to the Chinese congregation that we are trying to build. Our tutor is very open to help us evaluate the services and how they relate to the culture here. “After church they all come over to our apartment for a waffle feed and fellowship. We are still working to make the ‘center’ look more inviting for worship, and we are making some headway on that. We have put up a cross made of stone for ‘Living Stone’ church and we are dealing with a sink that is located in the front corner of the sanctuary space. It’s not big enough to be a baptistery unless we baptize cats or other small animals. 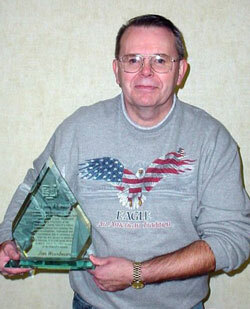 Jim Woodward was honored by the county sheriffs department as their man of the year. This is the highest award given to any citizen by the sheriff department in Hancock County, Ohio. Jim is the owner of Razor’s Edge barbershop and a member of the First United Brethren Church of Findlay, Ohio. In 2004, First UB did the Purpose Driven Life program. Rick Warren’s challenges gave Jim a vision to minister to the prisoners of the county jail. First, he challenged the church to make Christmas packets with socks, a New Testament, a candy bar, and a stamped envelope with a Christmas card to be handed out to the inmates during the week of Christmas. After that, Jim organized a monthly program where the inmates received a homemade cookie and a cup of soda. During that time, speakers would come and shares their testimony, song, or message with the inmates. In December, three inmates gave their lives to Christ as a result of the message given. One inmate was even released for a few hours to attend church with Jim. For the past couple months, local churches have been organizing into “clusters” of 5-7 churches. A good share of our churches are now identified with a cluster. Bishop Ron Ramsey plans to announce the cluster leaders by the end of the year. The ten annual conferences in the United States are in the process of discontinuing their cooperative ministries. Here is a quick status report on some of the conferences. Mid-Atlantic. Mid-Atlantic Conference voted unanimously during its mid-year session on November 12 to discontinue the conference as of the end of 2005. Most of the conference’s 55 churches are expected to be functioning in clusters by that time. Legal ownership of the Rhodes Grove Camp and Conference Center will be transferred to its board of directors, but the National Conference will establish a meaningful covenant relationship with the ministry. The Mid-Atlantic Foundation will be used to provide group health insurance and stewardship services to churches on the East Coast and elsewhere. Mid-Atlantic includes churches in Pennsylvania, Virginia, W. Virginia, Maryland, New Jersey, New York, and Massachusetts. Central. Central Conference has been closing down its cooperative ministries and helping churches make the transition to the cluster arrangement. Because of pending legal action involving the conference, Central Conference cannot dissolve the corporation. Until a lawsuit is settled, Central Conference will continue as a legal entity, with a downsized (six person) conference council providing oversight. Superintendent Tom Brodbeck will continue as fulltime superintendent until the end of 2005, and will then continue in that role on a part-time basis at $100 a month, mainly to provide general oversight and handle whatever legal details are needed to formally dissolve the conference. Central Conference includes churches in Indiana, Ohio, and Kentucky. Michindoh. The Michindoh Annual Conference voted 72-10 to empower its conference council to care for all of the details of dissolution. The conference council meets this week. Sandusky. Sandusky Conference approved disbanding as a conference during the 2005 annual meeting, which came after the National Conference. Conference administrative activities will be handled by the Conference Council through 2006. Currently there are nine churches in the East District and 7 in the West District. Over the last two years, Sandusky has lost or closed four churches (most recently the Jerry City, Ohio, church). Most of the churches were already involved in a cluster group. California. Most of the churches of California Conference have withdrawn from the denomination and started their own group, which they are calling the United Believers in Christ. Only the UB church in Pixley, Calif., and the Hispanic Cellular Church in Canyon Country remain. Michigan. Michigan Conference will hold a mid-year conference in February, and will make decisions then about the future of the conference. Most of the churches are already organized into clusters. Ron Evans was assigned as the senior pastor at the Mt. Zion Church (Decatur, Ind. ), effective October 16. Kent Maxwell was assigned as interim pastor at the Lancaster Church (Lancaster, Ohio) for the period of October 30, 2005 to January 31, 2006. Dennis Rowe has been assigned as the senior pastor of the Hillsdale church (St. Marys, Ohio), effective December 4. 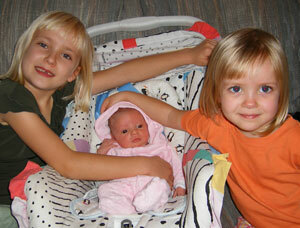 Dave and Cathie Datema are the parents of a new baby girl–their third daughter and fourth child. Julie Violet Datema arrived on November 9. She entered the world with breathing problems, and spent eight days in the hospital before coming home on November 17. The Datemas are endorsed UB missionaries serving with the US Center for World Mission in Pasadena, Calif. The US National Conference is transitioning to a structure based on clusters–an average of seven churches whose pastors meet together regularly for accountability, encouragement, and training. Many of the clusters have already been formed, and Bishop Ramsey will be appointing the cluster leaders in the weeks ahead. A meeting of cluster leaders is scheduled for early in 2006. The UB website contains a list of the clusters which have formed thus far. Most are organizing on a geographic location basis and staying with churches in their own conference (though a few have crossed conference lines). Bishop Emeritus Clarence Kopp underwent surgery on Monday, December 5, to remove a fist-sized mass on his liver. However, they began with a scope, since it was suspected that the tumor might be hiding additional diseased tissue. That turned out to be the case. The surgeon felt that the tumor was either positioned much differently than expected or that it now had grown to the point where three-fourths of the liver would need to be removed. As a result, no surgery was performed. Bishop Kopp will now begin six months of chemotherapy treatments to shrink the tumor. He was expected to be released from the hospital today. Global Ministries Director Gary Dilley left for Sierra Leone on Wednesday, November 30, and will return on December 10. Joining him is Joe Abu, a Sierra Leonean who now pastors a UB church in the Philadelphia area. They are doing some leadership development work with people from Sierra Leone National Conference. Global Ministries is seeking to finish the transitional steps needed to move Sierra Leone from “mission field” to independent “national conference,” a process that was interrupted by the civil war in the 1990s. This has become exceedingly important as the Middle East floods Sierra Leone with funds to help spread the Islamic faith. On Monday, November 28, Elsie Ramsey, wife of Bishop Ron Ramsey, underwent some tests for what they feared could be cancer. They are thankful that that wasn’t the case. However, later in the day they learned that E. J. has a disorder called temporal artoritis, a condition of inflamed blood vessels in the head. It was affecting the optic nerve in E. J.’s right eye, and if left untreated, could lead to total blindness. E. J. is on a heavy regimen of steroids right now, and the treatments are going well. The doctor feels they got it in time and Elsie may not need to be on the steroids very long. It’s not life-threatening, and there is no pain, but as mentioned, it can lead to blindness. E. J. is also diabetic, and steroids can adversely affect diabetes. But thus far, she has experienced no adverse side effects. As churches, please remember E. J. and Ron in your prayers.